Finance and accounting departments are familiar with required, standard financial reporting. It’s normal corporate governance. An enterprise resource planning (ERP) system, when tailored to a business's individual processes, takes care of the requirement. Senior management needs to see how the company is doing between periods, so customizable reports from an ERP database are critical. Getting information so that management can make better decisions requires strong reporting capabilities from the business system. Financial numbers don’t lie, but gathering the right numbers is prone to error. Companies that rely heavily on spreadsheets to keep financial information often do so for convenience. The convenience is usually on the part of the person gathering the data. There is also a control element to using spreadsheets: the person or department that keeps the spreadsheet holds the keys to its use. Having and using an ERP system precludes the need and use of distributed spreadsheets. Admittedly, spreadsheets keep cropping up in organizations, so constant vigilance is required to move the spreadsheet data to the ERP system as quickly as possible. Multiple locations and business units sometimes retain their own spreadsheets for purposes of production and local operations. Having each location maintain its own chart of accounts can lead to a disaster. A single ERP system centralizes and standardizes accounts, which is vital to accurate reporting. Otherwise, accurately comparing different business units is nearly impossible. It is probably obvious but still worth mentioning that a single ERP system dramatically reduces the time required for period reporting at the consolidated level. Having managers create and run their own reports from the financial data saves everyone time and effort, and using a financial ERP system makes that possible. Sure, the company has to buy and implement a business intelligence system with easy-to-use tools, but the efficiency gains are many times greater than the cost. Without an ERP system, self-service reporting is impossible. Regulators and other external organizations do not get access to the ERP system but need data from it nonetheless. Having a single source for all outbound data relieves a lot of stress. Data and reports sent out are repeatable. The data stored in an ERP system make up the system of record—not a bunch of spreadsheets scattered throughout the company. An ERP database is just one source of data for corporate reporting. Often, the data needs to be combined with other databases to produce a meaningful report. That’s just not feasible or reliable for a company that doesn’t have an ERP system. 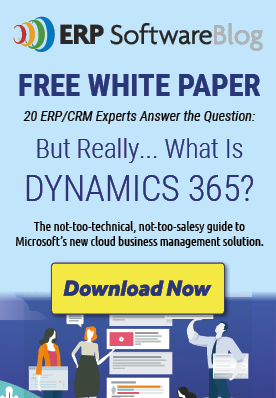 Visit our website here to download the full guide to learn more information about how an ERP solution from Microsoft can simplify your reporting.